We are one of leading companies in the industries for the manufacturing and exporting of Tower lights. These light are applicable for the road safety. 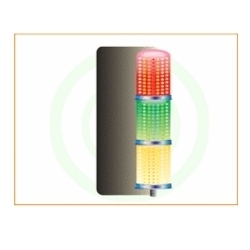 These tower lights are manufactured using premium quality of raw material procured from some of the most trusted vendors of the industry to assure our clients with better quality. We have a team of engineers who has the in-depth knowledge about designing these lights and they precisely design these lights in order to meet the satisfaction of the clients. Balaji Electronics and Automati?is a major provider of products, services and solutions to industrial and commercial user of electrical and electronic safety equipments in India. Headquartered in Jamshedpur, India, Balaji Electronics serves as one of the primary supply channel pattern for nearly 20 suppliers and more than 100 original equipments & contract manufacturers and commercial customers through an extremely deep-rooted network. Established in 1999 as a small outfit, supplying safety equipments to TATA group of companies, the company exhibited phenomenal growth and advanced by leaps and bounds by constituting firm, win-win relationships with customers. Later, various electrical and electronic equipments were added to the company's marketing stable. Balaji Electronics brings the turn-key solutions to its customers and suppliers to breadth of markets including Steel, Automotive, Bearings, Railways, Cements, Mines, Telecommunication and Industrial Equipments Manufacturers. Balaji Electronics have recently awarded Bharat Gaurav, a coveted industry standard appreciation, by Council for National Development, New Delhi. The concept of time to market has become increasingly complex in today's ever dynamic business environment. Balaji Electronics provides specialized services and expertise at each stage of product's life cycle thus accelerating and simplifying the time to market journey. The services start with Balaji's technical personnel regularly visiting the customers' sites to gather the current requirements. Then, Balaji Electronics makes connections across a complex supply chain, manages that complexity and injects speed at every juncture of the journey to the market for the products with design, fulfillment, materials planning, inventory managements and installations solutions.? With 7 years of highly rewarding industry experience, Balaji Electronics demonstratrates the ability to be innovative and responsive to global business demands and requirements, working together with the customers and suppliers to their business success.